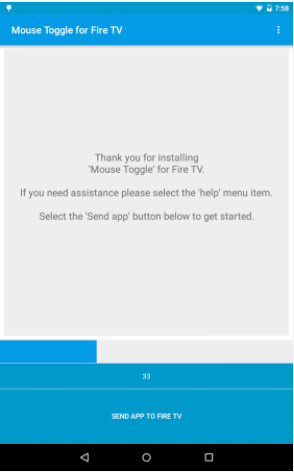 Name: Mouse Toggle For Fire TV Apk. 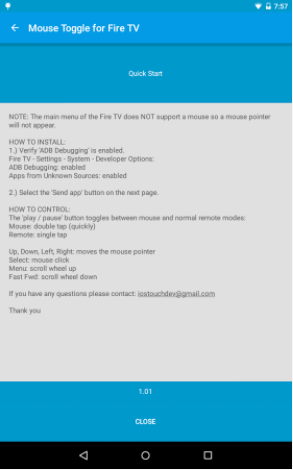 Mouse Toggle For Fire TV Apk is a premium android app developed by fluxii. It is compatible with Android 2.3 and can we used with latest Amazon Fire TV remote control. Mouse Toggle For Free Tv 1.08 is the latest version that has accelerated mouse pointer and scroll wheel repeats. It requires Amazon Fire TV or Fire TV Stock and an original remote controller. It works regular mouse controller with which you can click, long-click, scroll up, scroll down and detect other devices directly from your Android device. Option For Adding IPs manually. Mouse scroll up and scroll down option. Click And Long Click Option. Fire TV – The Fire TV and the Fire TV Stick are supported. Android Device with configured Mouse Toggle For Fire TV Apk. Remote: The stock Fire TV or Fire TV Stick remote. Configuring the app is really easy. You can follow these simple steps to configure this app on your Android device. 1- Verify that “ADB Debugging” is enable on your Fire TV. 3- The App will open on fire tv. Press “play/pause” button quickly 2 times on the remote to toggle between normal remote and mouse function. i have lost my amazon tv remote can i use this app to convert my amazon tv into a remote?